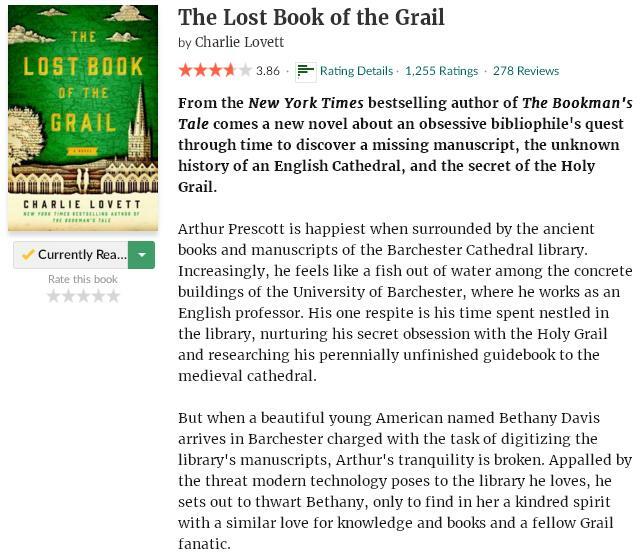 I’m going to try and read the most urgent ARCs before the end of the month and then concentrate mostly on my own books in August… Most of them are thrillers, but I needed something different so I decided to pick up The Lost Book Of The Grail by Charlie Lovett. I’m not fully convinced yet, but it is still early days and the blurb shows a LOT of promise. Fingers crossed! This entry was posted in Book Memes, Teaser Tuesdays and tagged book review, charlie lovett, teaser tuesdays, the lost book of the grail by Yvo. Bookmark the permalink. Great to hear you joined! This book has been packed with bookish quotes and descriptions so far! Oh, this book sounds really good. I hope you enjoy it! It’s superslow but I love the many bookish quotes and descriptions! Well I hope it gets better for you! The many bookish references and quotes are definitely wonderful.